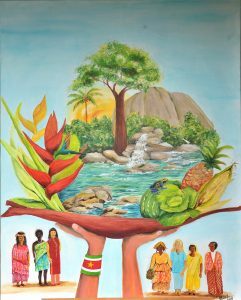 The artwork for World Day of Prayer 2018 by Alice Pomstra-Elmont captures the beauty of Suriname, a coastal country at risk due to rising sea levels due to climate change and deforestation due to illegal mining in its rain forest. Suriname is a beautiful, tropical South American country that is home to diverse people and a wonderful abundance of vegetation and wildlife. As the writer country for the World Day of Prayer 2018 service, the women of Suriname reminded us that “All God’s Creation is Very Good!’ Even though World Day of Prayer 2018 is over, it is important that we do not forget their words and prayers. Global warming is still an environmental crisis and climate change is still a harsh reality that disproportionately affects communities, cities, and countries in the Global South. Take time to reflect! The WDP service urged us, as Christians, to re-evaluate the effect that our actions have on all life on the planet. Ask yourself: Over the past year, have I made changes in my daily habits or routine to protect the Earth, the air, waters, and trees? Over the past year, have I shown love for my neighbour (humans and other creatures) in how I use and conserve resources? Over the past year, have my actions matched my faith? Creator, thank you for the Earth—this generous gift of life that you have given to us. We thank you for the deep seas, vast grasslands, towering mountains, lush rainforests, and everything in between. Forgive us for neglecting to take care of this gift. Call on us to reduce our individual and collective carbon footprint. Help us to embrace and live with great respect for your creation. Amen.